Have you ever fallen in love with something the first time you saw it…and just had to have it? 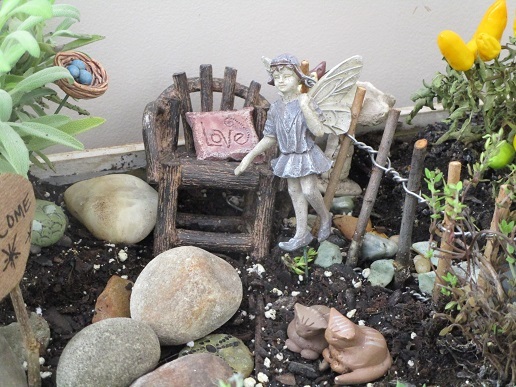 That’s how it was with this Fairy Garden…yes, it’s called a Fairy Garden. It was a raffle item at a fundraiser to help my niece Tonia to cover medical expenses for her late husband, Frank. Something about this 14 x 14 box of dirt grabbed my heart. Maybe it was the fence…maybe the fairy, the cats, the dog, the bike, the turtle or the birds’ eggs in a nest. Maybe it was the live peppers. Maybe it was the combination of it all. Oddly enough, I saw beyond the Fairy Garden to another message. We create our own gardens in life. We can have animals, vegetables and nature in them all…or not. No matter what we choose, we can create the garden that best suits us. We can fill it with love, or not; animals, or not; nature, or not. But there’s one thing that makes every ‘garden’ yield its fruit — Love. How will you make your garden? This entry was posted in Creativity, Inspiration, Love, Nature, Spiritual Living and tagged Creativity, inspired living, Love, Nature. Bookmark the permalink.